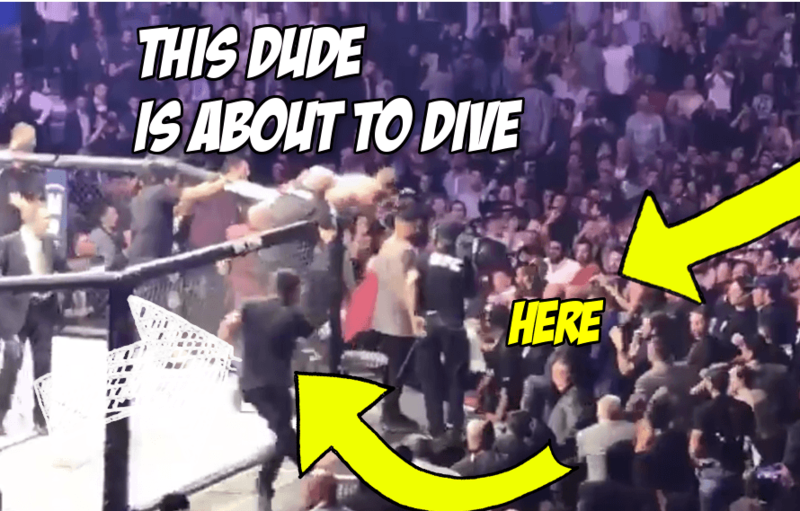 He not only wanted the piece of some of that good UFC 229 brawl action, he also thought his best course of action was just to stage dive into a crowd full of fighting people. Oh and this was a ordinary dive. No, no, no, this was. This was. I don’t even know. Ricky “The Dragon” Steamboat would be proud of our crazed dude attempting a flying bodypress right into the melee. First our hero appears at the 39 second mark of this excellent video of the entire brawl. Look at him zoom pass the official UFC cameraman, pick up speed and then fling himself like a projectile into the crowd. Just no regard for his body or the bodies below him. What a guy. Now let’s take a closer, to truly track what the hell this dude was thinking. That is a full on leap for glory. He gets little to no air in his dive but he it gave it his all. 100% heart. No matter which side of the UFC 229 brawl you fall on, you want this guy on your side. Update: Oh no. Did he trip and crash to the T-mobile Arena floor? Or did he just dive and completely miss everyone? Nothing but concrete. 10 seconds into the video, just watch. Video: Is this fan picking his nose on camera at UFC Phoenix a hero?